Search and rescue (SAR) missions in Poland are performed by the Air Force, Land Force (1.Dywizjon Lotniczy based at Leznica Wielka) and Navy squadrons. The latter operates from its bases at the coast: 44 Naval Air Base Darłowo (Mil Mi-14PL and PZL Swidnik W-3RM) and 43 Naval Air Base Gdynia (Mil Mi-2 and W-3RM). The Air Force created three Grupa Poszukiwawczo-Ratownicza (GPR – SAR Group) which are all directly reporting to the 3. Skrzydła Lotnictwa Transportowego (3rd Transport Wing) headquartered at Powidz air base. 1. GPR is based at 21. Baza Lotnictwa Taktycznego (21 BLT) and operates the Mi-2RL and W-3RL, 2. 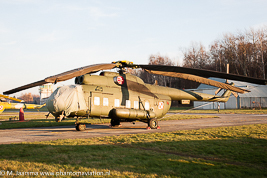 GPR is based at Minsk Mazowiecki (23 BLT) also equipped with the Mi-2RL and W-3RL and 3. 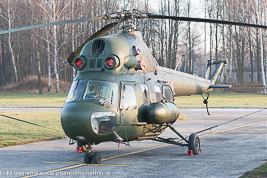 GPR is based at 8 BLT Krakow-Balice and operates the Mi-2RL and Mil Mi-8P/SAR. The 3rd SAR group stood up on 31st December 2008 and started its operations on January 1st 2009. 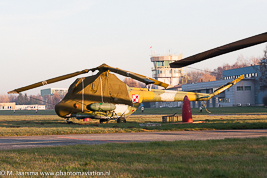 At Krakow-Balice it occupies the most Southwestern ramps to operate its helicopters adjacent to its 12. ELTr (PZL Mielec M-28B/PT GC) and 13. ELTr (Airbus Military/Casa C-295M) colleagues. Capt. Jastrzębski second from right, 1 LT. Kanadys left with their colleagues. 1Lt Kanadys serves as the units media representative. After graduation from the Polish Air Force Academy in 2005 the lieutenant was assigned (2005-2011) to 1 Dywizjon Lotniczy- 25 Brygada Kawalerii Powietrznej (25th Air Cavalry Brigade). During this assignment two tours were done, the first in Iraq (9 Polish Military Contingent – PMC flying the Mi-8 in 2008 ) and the second in Afghanistan (4 PMC flying the Mi-17 in 2009). From 2011 Lt Kanadys joined the 3. GPR at Krakow. He currently is a Mi-8 test- and instructor pilot and accumulated 1.345 flying hours on the Mi-2 (54hr), Mi-17 (164hr) and Mi-8 (1.127hr). For his participation in the PMCs the lieutenant was decorated with the Bronze Medal "Merit for National Defense", Star of Iraq “participation in the 9th PMC” and the US Army Commendation Medal for the 9th PMC. Lieutenant Kanadys explains the search and rescue mission after all visitors were welcomed by 3. GPR deputy commander Captain Wieslaw Jastrzębski. ‘The 3. GPR mission is dedicated search and rescue but when needed missions can also be flown in the transport role, especially with our Mi-8s. We have 15 pilots, six crew chiefs, four flight medics and four rescue men assigned. 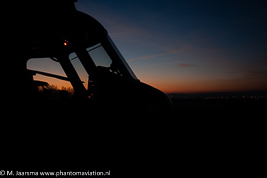 All of our pilots are qualified on both helicopter types and before joining 3. 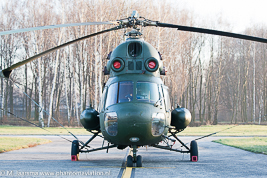 GPR already accumulated many flight hours on one of the helicopter types operated by the Polish armed forces. To ensure a quick response on emergencies 3. GPR maintains 365 days a year 24/7 alert status. During summer time the time from alert to take-off is 15 minutes, during winter time this is 20 minutes. Our alert crews are on 24 standby duties in the nearby group building and start their shift at 08.00 The first job is to check out the helicopters by executing rotor runs and instrument checks. Of the eight (see table below) assigned helicopters one is placed on alert which can be either the Mi-2 or Mi-8. A second helicopter is also assigned to SAR alert with the only difference that here the remove before flight materials have to be removed. All the other helicopters are either parked on the ramp, used for training or undergoing maintenance’. ‘For rescue mission we have both the Mi-2 and Mi-8 available. 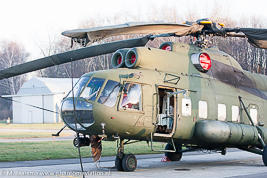 We received the Mi-8s from 1 BLT at Warsaw where they were in use as VIP transport helicopters and from 2 Aviation Squadron Kiln-Liaison from Bydgoszcz (this unit is now disbanded). They can be recognized by the five large square windows on both sides of the cabin. Before they entered the SAR service they have been modernized by Wojskowe Zakłady Lotnicze nr 1 (Aircraft repair centre 1) at Łodz airport. The modernization included: a NATO compatible communication system(UKF/VHF 30-400MHz), a DF-430F direction finder, AN/ARC-210 transceiver, navigation systems: TACAN, VOR/ILS, search light (SX-16) which we refer to as ‘Night Sun’, a camera system and a VCR recorder, mirrors and all medical and rescue equipment including a hoist. The hoist can carry up to 270 kilograms (kg) of weight. For safety measures the line can be cut by either the hoist operator or the pilot in command. The mirrors which are installed on both side of the cockpit are used during rescues so we have the availability to see and check what is going at the back of our helicopter. 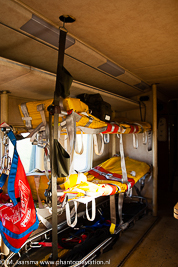 The Mi-8 offers two stretchers and four seats where minor injured people can be transported. The Mi-8 crew consists of a pilot which is also acting as the SAR mission commander, a co-pilot and on a foldable seat in the cockpit the crew chief / flight engineer. The flight medic and rescue man are seated in the cabin. 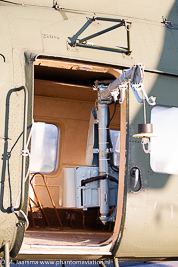 When the Mi-8 is tasked with a transport mission we are also able to transport 3.000kg as under slung load with the use of a hook installed underneath the helicopter. 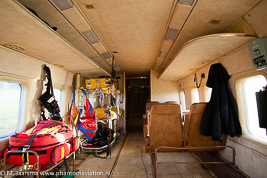 The smaller Mi-2 is equipped with one stretcher to move an injured patient and here our co-pilot seat is used by the flight medic, the rescue man sits in the back’. ‘To maintain our readiness we are conducting training flights. Most of our annual flying hours, the standard for 2013 is at least 40 hours, are used for VFR, IFR and flying in poor weather conditions which is also done by our colleague helicopter units across the Polish armed forces. As our base is in close proximity to the Tatra mountains located South of Krakow and running into Slovakia we also conduct low level and mountain training flights. In cases of actual SAR missions in the border area we are cleared to fly into the Slovakian border skies, the same applies for our Slovakian Air Force colleagues who can conduct SAR missions in the Polish border region’. In 2013 one main rescue mission was flown by 3. GPR. On May 23rd Lt Kanadys was one of the crew members on alert duty together with the rescue commander Captain pil. 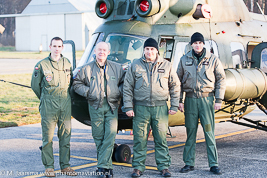 Przemysław Korzeniowski, flight engineer Senior Warrant Officer Miroslaw Nastusiak and rescueman sergeant Dariusz Domagała. The lieutenant briefs about the rescue mission. ‘Our 24 hour alert status started as usual with the check of the alert helicopter followed by reporting our readiness to the Rescue Coordination Center (RCC) in Warsaw. At about 12.00hr we received an alert from the RCC. Within five minutes we started the Mi-8 performing the functional checks, meanwhile receiving the information that a small airplane went missing (which proved to be a Piper PA-34 registered SP-HIN routing from Poznan to Bratislava, Slovakia) and our designated search and rescue area. 15 minutes after receiving the alert we took off from Krakow-Balice. As the pilot of the mission plane didn’t use the aircraft emergency systems we had to perform a visual flight rules mission. We headed in the direction of mount Zar which is located near the city of Bielsko-Biała to the Southwest of Krakow. The rescue mission was joined by the Tatra mountain rescue group with a Sokol W-3 and the Malopolska police. We then received another alert of a possible missing aircraft in the vicinity of Babiogórski Park Narodowy and our mission was redirected towards that area. We headed to the Southeast in the direction of Zakopane. Our rescue mission here was severely hampered due to the limited weather conditions with a low cloud base. A rescue team on the ground (GOPR Górskie Ochotnicze Pogotowie Ratunkowe – volunteer mountain rescue service) discovered the debris from the aircraft. As we couldn’t support from the air as the mountain tops were covered in the clouds the mission was terminated’. (note of the author: one golden rule for all rescuers is to maintain their own safety first). ‘We returned to Krakow where we landed at 14.35hr. The Mi-8 then received fuel and was serviced and put back on alert while the rescue crew completed the mission briefing and filed out all necessary forms’. During the visit of the author the 3. GPR deputy commander (Capt. Wieslaw Jastrzębski) also hosted the civilian rescue organization OSP Kęty. This unit conducts rescue missions from the ground. Their truck is able to carry a rescue crew, accommodates the transportation of rescue dogs and offers modern tools like hand-held infra red systems. During this first meeting the crews from both sides could get acquainted with each other equipment. Sergeant Krzysztof Stępniak showed the helicopters and its rescue equipment followed by a presentation of OSP Kęty Jerzy Herma during which a lively discussion started. The next step will be a series of combined work-shops aiming at increasing safety and exchanging knowledge / best practices. 3 GPR crews with crew from OSP Kęty. All 3. 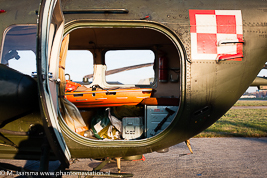 GPR helicopters have a fixed rescue call sign assigned (PLF – Polish Air Force). When flying on a local mission and within Krakow-Balice air traffic control zone the call sign Wawel is in use. The Wawel c/s refers to the castle in Krakow’s city center. The oldest Mi-2 in use by 3. GPR was built in 1976 and is in its 38th year of service to the Polish armed forces. Currently the Polish air force is looking to replace its rescue helicopters but an official request for bidding has as yet to be started. It’s might take three to five years before a new rescue helicopter will be serving the Polish Air Force mission but when fielded the 3. GPR will be the first unit to operate the new type. The author wishes to thank 1 LT. Sylwester Kanadys and WO Mirosław PANKOW for their support to write the article as well as deputy commander Captain Wiesław Jastrzębski and the 3. GPR crews for their assistance during the visit. Mi-8P/SAR search and rescue light The hoist installed on the SAR Mi-8s. 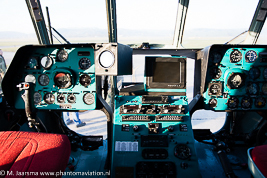 Mi-8 cockpit. The sun sets over Krakow-Balice airport In wintertime end of the afternoon.